Beating Australia might be beyond our national team, but the Academy lads have scored a famous victory over their rivals from Down Under, in magnificent style. The race is on for the signature of Wigan's Welsh prop Gil Dudson, while at the DW young starlet George Williams has bagged the coveted no.6 shirt. Warrington coach Tony Smith has been picking up tips from the NFL's champion San Francisco 49ers outfit and there's lots, lots more as usual. 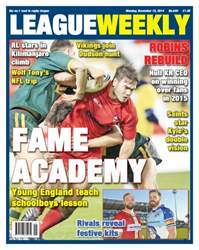 Packed with features, news and views ... every Monday, it's League Weekly!